So, this ended up being a longer post than I expected…Grab your coffee! When the announcement was made last year that Atlantic City would now have an Ironman branded 70.3, I knew I was registering. Sure, I’m not the biggest fan of how the brand treats the female pros (#50womentokona), but I knew that bringing the Ironman brand to AC would be a nice boost for the town. If you don’t already know, I’m originally from Ventnor, the town just south of Atlantic City. I grew up on the Jersey shore, went to Atlantic City High School, and am a proud alum of the Atlantic City Beach Patrol. This race would take place in the waters where I used to water ski and learned to row a lifeguard boat, on the very overpass I drove over every day to get to high school, and on what I consider the best place to run: the boardwalk. The race was scheduled for September, the best time of year from the local’s perspective, and it just so happened to be on my dad’s birthday weekend. Score! September at the shore is the. BEST. Friday: On Friday morning, I met up with Lottie, who was tackling her first 70.3! It was chilly (for me), a cool 53 degrees- I would certainly not be upset if this was race day weather! We went for a 45 minute spin on a section of the loop part of the course and then we drove the rest of the loop to get a sense of the roads and where we would need to go on Sunday. Some of the roads were a little rough, but nothing too terrible. As we were headed back to Lottie’s car, we actually saw a truck with workers patching up some spots of the road and marking where the road was a little rougher. After we parted ways, I drove the rest of the course on my way back home. There were a few rough patches through the Pleasantville neighborhood, but they were already marked, and if you were watching where you were going and not being a speeding idiot, you should be just fine. All in all, I was looking forward to the course, but I did make a note to bring 2 tubes, rather than the 1 I usually carry, just in case. Later that afternoon, I went to the Ironman Village to pick up my packet and go to the pre-race meeting. 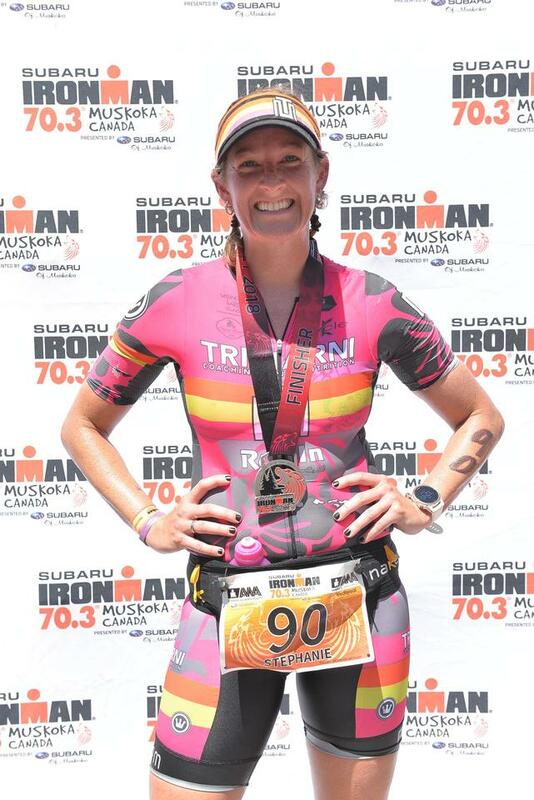 This was my first Ironman branded 70.3 (and my first Ironman branded race in the US) so of course I spent too much money in the merchandise tent. Later in the afternoon, Cynthia arrived in town with her dad, and we went to the Ventnor beach to get in a little open water swim. Even though the swim would be happening in the bay and not the ocean, it was nice to get in the water. There was a tropical storm way out at sea, but it’s effects could be seen/felt already in Jersey. We had to deal with some decent surf, and I loved every minute of it. Not sure if I’ve mentioned it here, but one of my first ever ocean swims was in hurricane swell, and since that day I have fallen in love with the thrill of swimming in big surf. Saturday: Saturday morning, I woke up without an alarm, which was so lovely. Unfortunately (or fortunately?) my body doesn’t know what “sleeping in” is, so I was up and at ’em by 7am. I went for a short spin down to Longport and back, followed by a short jog on the boardwalk. Gosh, it felt good to be home to race. I went to the village in the afternoon to rack my bike and get body marked, and the rest of Saturday was pretty low key- I really wanted to go to the beach with dad, but opted to stay out of the sun and inside relaxing on the couch instead. We made pizza for dinner, and then it was early to bed for me. 4:30 would come quickly! I didn’t sleep super great on Saturday night, but I wasn’t too worried- I am a firm believer in “the night before the night before” is the most important:) I knew race nerves were kicking in because I needed to force down my overnight oats and coffee. I put on my kit, braided my hair, checked the weather (High of 83 and humid. Wind from the South at 9mph) and off we went to Bader Field. I knew that traffic was going to be bad- they had warned us at the pre-race meeting to get there early, and I remembered the issue at one of the AC Tris where they had to delay the start because of the long lines of cars getting in. Thankfully, we were coming from the west, and were able to get right in and not sit in all the traffic. I’ve seen lots of complaints about the traffic to get in, and I know that some people had to rush to make it into transition before it closed, but from my personal experience, I didn’t have a problem. I do think there needs to be a solution to ease some of the congestion, I just don’t know what it is and what is doable with city ordinances and such. I walked to the swim start, about half mile or so from transition (throw away flip flops are a must if you do this race!) and they made an announcement that the swim had been cut to a mile. Bummer, that’s where I can get my advantage! Dad and I had talked strategy last night and since the tide was coming in, I knew we’d be swimming against it on the first stretch of the swim. My tactic would be to swim closer to the sea wall, where it wasn’t pulling as strong, and then swim more in the middle of the channel after the turn around. I was still feeling surprisingly calm, ate a few Skratch chews, and drank some water as we waited in the corral. Finally, it was time for my wave, wave 13 to line up and then get in the water. I said hi to a few lifeguard friends and then jumped in and swam to the start line. It was a floating start, so I stayed to the far right. Just before we started, a woman from the wave before us was pulled from the water, maybe 5-10 meters from the start. Great way to start the race, eh? Once she was in the boat and out of the way, it was our turn to go! Immediately, I took off. I swam with a girl for a handful of strokes, but then she dropped back. I didn’t see any other light pink caps nearby, so I figured I was in the lead, but I didn’t know for sure. Shortly after starting, I started running down people in the waves before me. Thankfully, I was far enough out to the right that I didn’t trample over a lot of them. I passed through the two red buoys that I presume was for the live tracking, and continued to swim with the yellow buoys to my left. I was feeling quite good, and was approaching one of the green channel markers, when I sighted and noticed a wall of lifeguard boats and paddle boards directly ahead of me. There were definitely swim buoys behind them. This was curious. On my next sighting stroke, I heard them yelling to turn. That’s weird. Maybe this was the “shortened” course? Despite being confused, I made a sharp left and swam towards the next buoy I saw. Around the orange buoy, and then keeping the orange buoys on my left, I swam towards the swim exit. If you look at the map above, I would say that I turned shortly after the little piece of land that was jutting out from the left side of Bader field. I really, really wish I had a watch that recorded my swim distance, because I really have no idea how far I actually swam. My time was only 19:45, so I’m wondering if I did miss a buoy or something. The race site says the swim was cut to 11oo meters, but there’s been some chatter on the Facebook page that this isn’t accurate. I guess we’ll never really know! T1: I ran out of the water, wiped my face (that bay has some nasty grime), let the wetsuit strippers peelers de-wetsuit me, and quickly rinsed off in the showers they had at swim exit (thank you!!). I saw Lottie, and gave her a little pat on the booty and yelled “Yeah Girl!” before heading into transition. Tube, sunglasses, Skratch, helmet, Go! And off I was out of transition! Bike: The bike course is what I’ll call a lollipop: a pretty straight shot out to some more rural roads, a big loop, and then back to transition via the “stick”. I’m really glad I was familiar with the roads and the course; it makes such a difference! I knew what to expect and when, and could adjust as necessary. I was prepared for the rough roads in the Pleasantville neighborhood, the somewhat bumpy parts at the start of the loop, and the curb at the entrance to the Wawa parking lot, that thankfully had a volunteer, signs and a carpet to lessen the jump. Anyhow, it was on the bike where it really hit me that there were a LOT of women in this race. According to the Ironman Atlantic City Facebook page, this race held one of the highest women to men ratios in all the IM events in the world. I absolutely loved being out there with so many strong women who were tackling this distance. Around mile 20, I was passed by a female. Obviously I looked at her calf, and sure enough, she was in my age group. Dang it! I tried to keep up but then told myself to race MY race, not hers. The first 25 miles of the race flew by. Perhaps it was because I was most familiar with that part of the course, or because I was literally on my way to the fastest 56 miles I’ve ever ridden, but I was just having so much fun! We were riding on some nicer roads at that point and it was shady, so at this point, it was quite enjoyable. At one point on this back loop, there was a curve in the road, and BAM the headwind hit. Thankfully, this was short lived, and we curved again and it wasn’t as noticeable. I think 3-4 women passed me back here, and one or two of them were in my age group. At that point, I lost a little motivation; my BHAG was to place top 5 in my AG for this race, and now I was one place away from dropping out of the top 5. We made another turn at mile 30, and again, the wind hit. It didn’t seem as bad, but this part was definitely a bit harder for me. The roads were smooth and wide open, so I just put my head down and tried to ride by watts, not by speed. I also started doing the math in my head to figure out what my final time might be. As I calculated, I was shocked – I might be able to go 2:40. That’s just crazy! I tried not to get overly excited, and just kept pedaling. There’s no such thing as a good bike and a bad run. You have to pace yourself in the bike so that you can have a solid run. I was hopeful I was pacing myself appropriately. As I approached the final aide station at mile 38ish, I debated whether or not I should grab a water. It hadn’t been super hot, and I thought was doing pretty good on my nutrition: I had drank two bottles of Infinit (Bottle 1 was Speed formula, with a pinch of base salt added; the other was 1 scoop of regular Speed and 1 scoop of my custom extra salty blend). I had also had half a bag of Skratch chews because I felt hungry and needed something solid to satisfy my hunger. I had just started my third bottle of Infinit, which was two scoops of my custom salty blend, so I was considering the water to balance out the salt, since it was definitely not as hot and humid as I’m used to training in. I made the decision to skip, and I’m pretty sure that was the decision that ruined the rest of my day. As I rode the last 16 miles back to transition, I saw my teammate Heather who asked how I was feeling. I yelled back that I was feeling really good and kept pushing forward. With less than 10 miles to go, another girl in my age group passed me. I remembered sizing her up in the porta potty line before the race, and I wasn’t going to let her take me over. I passed her back, held the lead for a little, and then she passed me back. Dang it! I let her go, knowing we were close to the end of the ride. Maybe I could get her on the run. We entered Bader Field from the west, and you could see the start of the run: Lines and lines of athletes running back and forth. It looked like an ant farm…or a death march. I switched gears in my head to get ready for the run as I slowed for dismount. I was determined to have a solid run off the bike for the first time in a 70.3, and I felt prepared to do it. And, I absolutely love running on the boardwalk. I couldn’t wait to get started! T2: T2 is a little bit of a blur to me. I grabbed my things, and started to run out, but realized the sun was out in full, so I sprayed on some of my own sunscreen I had in transition before heading out. Right at the exit there were volunteers with sunscreen, so I stopped again and let them lather me up. I could tell I was already burned from the bike, so I didn’t want to get any worse. Better safe than sorry! Run: The best way to describe the start of the run is soul crushing. Ok, so I’m being a little dramatic, but we ran nearly 3 miles on Bader Field. I didn’t think that was possible, but sure enough it is. We ran on the blacktop that used to be the runway. Out, back, out, back, and around the perimeter. It was awful. It didn’t help that half a mile in, I got a side stitch. I didn’t walk right away; mom was right up ahead with her camera and I didn’t want to worry her by walking (even though my race plan included walk breaks at the aid stations! ), so I kept pushing. I made it to the first mile and then allowed myself to walk. My stomach was not happy. I was hot and I had a combination of a side stitch and nausea. I walked a little and then ran a little. I saw Cynthia, gave her a smile and wave, but then immediately went back to walking. What was going on with my stomach? I walked through aide station 1 and grabbed water and a cold sponge, and then started running again. You can do it Steph, I kept telling myself. Eventually, women started passing me. I watched my podium spot slip out of my hands, and disappointment washed over me. My body was not cooperating with me. By aide station 2, I had already started on Coke. Usually, I don’t need coke until I’m at least half way done the run. This was not good. I tried to put on a smile and just keep moving forward, to release the pressure that I had put on myself to place; I reminded myself of something my friend Beth had posted about her recent race: that she had raced with joy and it was magic. After reading that, “Race with joy” became one of my mantras for this race. The other was something a friend posted on my wall: “Be Amazing.” I tried really hard to remind myself of those mantras as I ran down Albany avenue and onto the boardwalk. I had been so excited about running on the boards, so maybe I could muster some strength to get my legs moving. I saw Heather and Matt at the Base tent, which gave me a little boost, and the wind in my face actually felt quite nice, but still I found myself walking way more than I wanted because of my stomach. My legs actually felt OK, but I just couldn’t continue running without feeling my unsettled stomach. By mile 5 I remembered I had tums in my fuel belt, so I popped two of them. Shortly after, my run finally felt good. I passed a few people but then, boom, I needed to walk. The rest of my run was pretty much a series of walking, running that didn’t feel good, drinking some Coke and sometimes some of my Osmo, running that felt really good and then an unsettled stomach feeling, followed by more walking. Rinse and repeat. I had a really hard time staying positive on this run and not just throwing in the towel. I’m pretty sure this was the first time my mind had gone down the path of a possible DNF. I wasn’t going to do that- I could walk the whole thing if I needed to. It was just really hard to watch my goal time get further and further away. I was going to turn in my slowest 13.1 to date. That’s a hard pill to swallow. Eventually, I was on the Pier for the second time, headed for the finish. I was SO looking forward to being done and sitting in the shade. It was super hot by now, and there was zero protection from the sun (with the exception of the portion on the Pier, which I walked a lot of). I saw the red carpet, and ran it in with my arms high in the air. I was done! After I finished, I immediately went over to sit in the shade and drink a water. I had zero appetite for any of the post race food. Once I felt sufficiently cooled down, I went over and found my mom. We went inside Boardwalk hall to sit in the shade some more, and I put my legs up the wall. We happened to go in the entrance which led to medical, and people kept asking me if I was okay. I felt okay, just tired. Eventually, I stood up, hoping to head over to get some food, but as we were leaving the building, I was like nope, my stomach is not having it. Mom told me that I should go to medical, and after a bit of “I’m fine mom!” I caved. The nice EMT gave me a pill for my nausea, and we sat down for a little longer and I drank more water. Finally, after 15-20 minutes felt like I was ready to enjoy the post-race food. Though I’m disappointed that I didn’t have the day I wanted, I certainly learned a lot from this race. I know I can put together a better race than I did, and so I’m already looking forward to planning my 2017 season. I cannot say enough great things about Delmo Sports, the volunteers, the emergency staff working the race, and the fans. This was an absolutely fantastic race, and I know that the Delmo staff will continue to make improvements in the coming years. If you ever have an opportunity to do a Delmo Sports event- DO IT. You will not be disappointed. And now, bring on the off season! !